Lorien Engineering Solutions has boosted its team in Poland with the appointment of two graduate engineers. 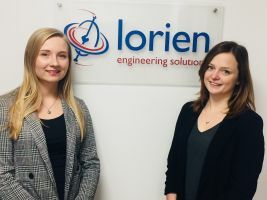 Sandra Sinka and Ewelina Was have joined the process team at Lorien, which is based in Wroclaw, Poland, and Burton-upon-Trent, UK. The company is a division of GP Strategies Corporation, which specialises in capital projects for food, brewing, drinks, life sciences, advanced manufacturing, logistics and safety compliance. Sandra recently graduated from Wroclaw University of Science and Technology, where she completed a Masters degree in power engineering. One of her first roles with Lorien was to support the project team with the development of a new margarine plant for a well-known food manufacturer. Ewelina is in the final year of a Masters degree in mechanical engineering at Wroclaw University of Science and Technology, with a specialism in process equipment. She also has a first degree in chemical technology. Ewelina joined a multi-disciplined project team to masterplan a combined fish and salad plant for an international client. She is responsible for conceptual process and packaging machinery integration with a focus on interfaces with other project areas. Lorien recently announced that Maciej Mielink has been appointed as process projects director while Maciej Król has been promoted to building projects director. The promotions follow a record-breaking year for Lorien, with revenues up by 11% and a best-ever sales performance. Lorien won eight new customers in Poland in 2018.